Tonight I had the opportunity to see the production of August Wilson's Fences at the Cort Theater. It was amazing. If you get a chance to go, go. 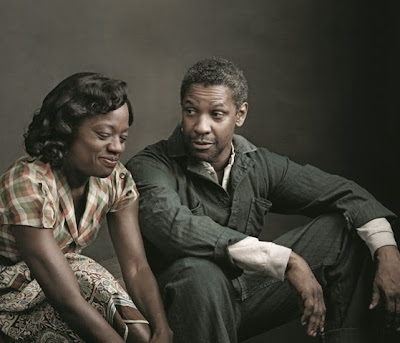 Denzel Washington is fantastic, but I was in awe of Viola Davis. She has a moment (and you'll know it when it happens) that is so incredibly fearless and moving it will blow you away. In the audience there was a bit of a scene as well. Lenny Kravitz, Aretha Franklin, and Will Smith and Jada were all in attendance. So I'm guessing this show is the hot ticket right now. sounds like quite an experience. Viola Davis is underused in my opinion, she is quite a talent! Saw a snippet of you and Beth and Nestor on Dinner:Impossible last night. Lenny Kravitz...yumm...uh, sorry - glad you like the play. Damon - we're not in Kansas anymore. I have a question. I'm not too sure about your past or anything. I don't really read up on that stuff. I was wondering how hard it is to get into the "entertainment" biz? Should I go to a film school or something? My thing is, I know I'm not good enough for acting unless it was an extra or something, I just want to do photography for movies, television, etc. If Beth has any idea's, I'd love to hear them also. Thanks bud. Awesome! Glad to have you so local to me. I have tickets to Fences for next week. Very glad for the sneak preview. It would be awesome to bump into you in the city. how smart of you to take your free time and spend it going to broadway..your a good man charlie brown. I just read this for a class. I really want to see it someday. Viola Davis is an alumni at my school so I'm indirectly proud she was your favorite! You are my girlfriend's favorite haha! Cannot wait for the finale on Sunday! Thank you for gracing my television screen for the past 6 years. I will miss you. 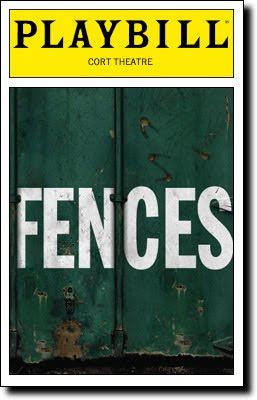 This production of FENCES makes me so proud of my many years working on Broadway (even though I didn't work on this production). I know EXACTLY the moment you mean -- it's one of those moments you can only have in the theatre, and it changes the way you look at the world. So glad you got to see it! After seeing Viola in 'Doubt", she started popping up everywhere. I didn't realize her vast variety of movie roles until looking her up on IMDB. A TRULY talented lady. Looking forward to seeing more of her. I suppose you guys can go on a culture binge, since you are back from Hawaii. Bet your missing it though. warmislandsun - Yeah I know, I'm in poo ville Missouri instead. But I think I'm going to CA for photography school next year. So hopefully I can escape St. Jo for a while.